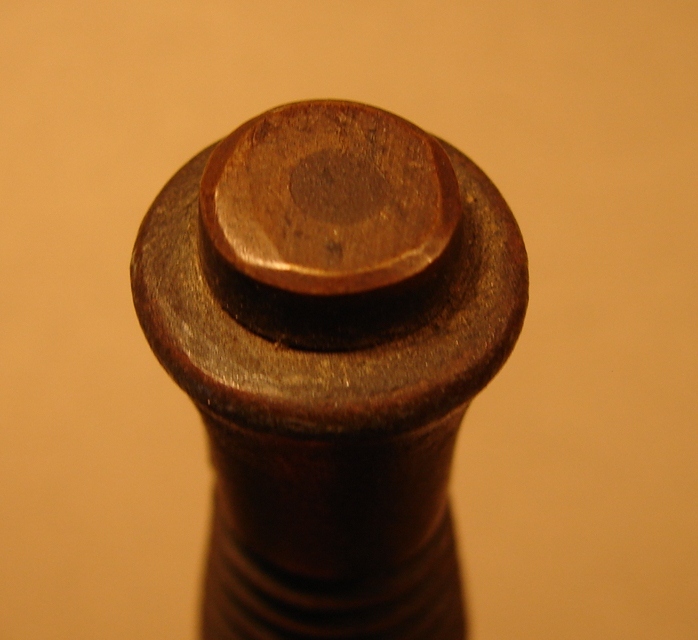 Top Nuts: Over the years much has been made of the differences in top nuts and the marks impressed into them. According to Robt. Wilkinson Latham in his excellent book on Wilkinson knives at least some of the brass nuts were made on automated machinery. They come is many styles and in either brass or steel. The exposed ones are crushed slightly and marked by clamping them into the jaws of a vise during assembly. 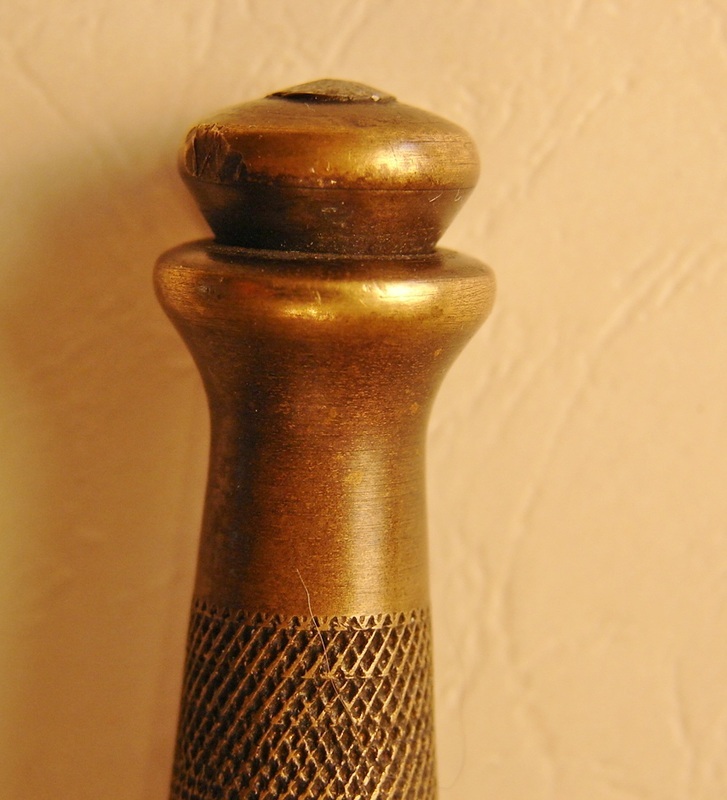 Once they are tightened the tang is peened over to prevent the nut from loosening or the handle twisting. 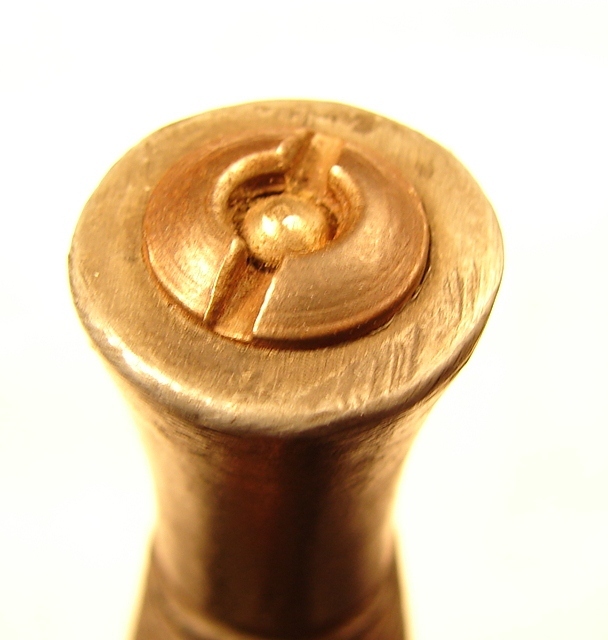 Below: Common nut used on most of the standard FS knives. 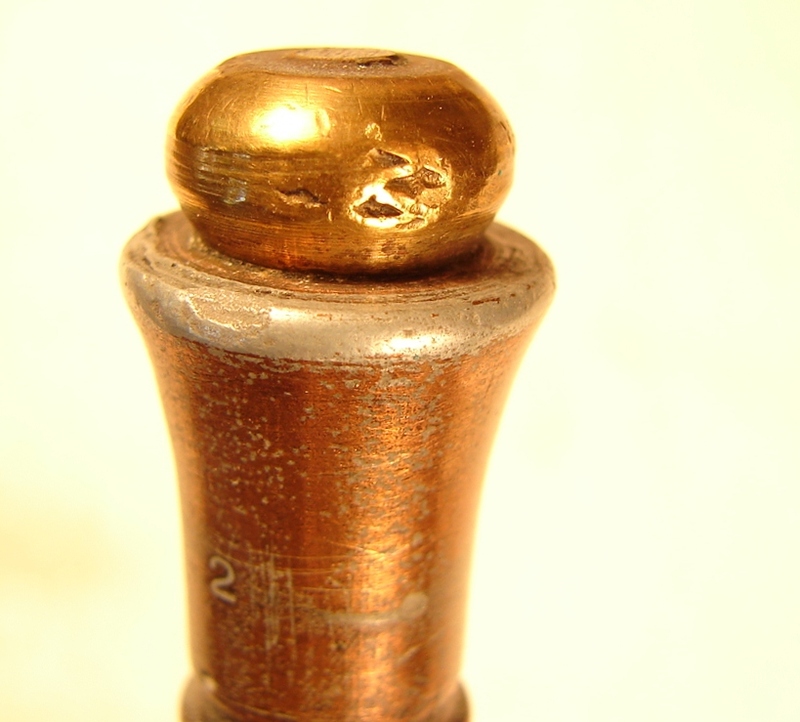 The impressions in the soft brass nut were created by clamping the nut in a bench vise for tightening the assembly. 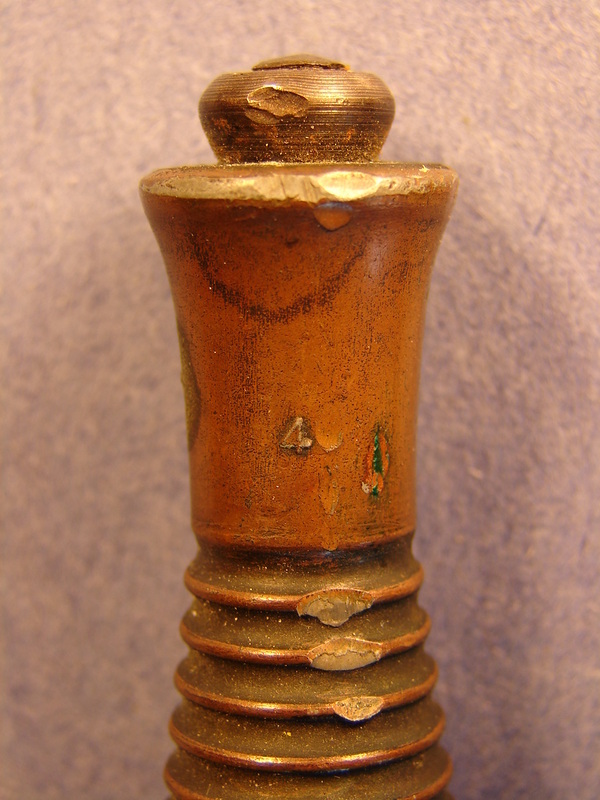 To assemble a F~S one would fit the guard over the tang, slide on the handle, and screw down the top nut. Then, clamping the nut in the vise, you would use a spanner of some sort to tighten the blade into the nut. It is the crosshatching on the vise jaws that left the marks. 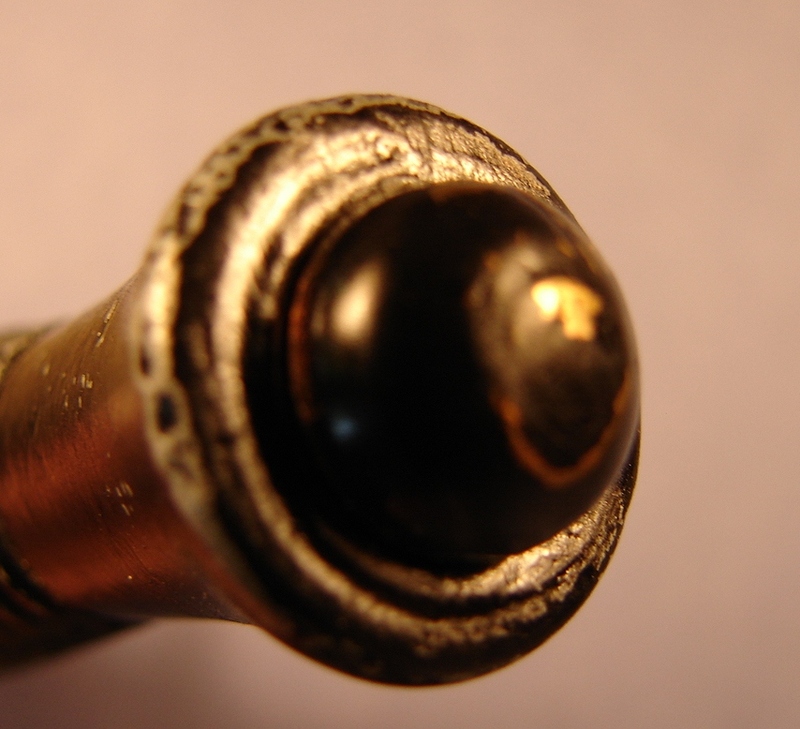 Once it was tight the excess tang could be ground off leaving enough to peen over, securing the nut. 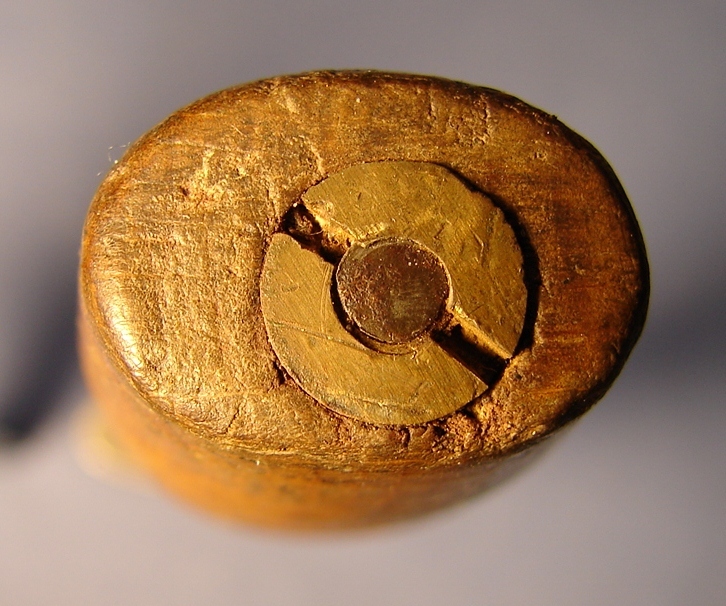 Not all nuts have the marks indicating that they were assembled differently or that a jig of sorts was used to hold the nut without damaging it. Robt. Wilkinson-Latham illustrates such a fixture in his book. 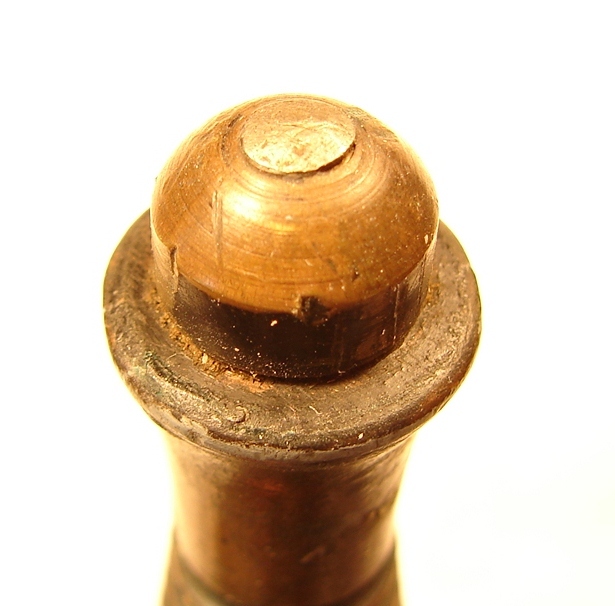 Above: This small nut is on a WW-II Wilkinson 3rd Pattern knife. 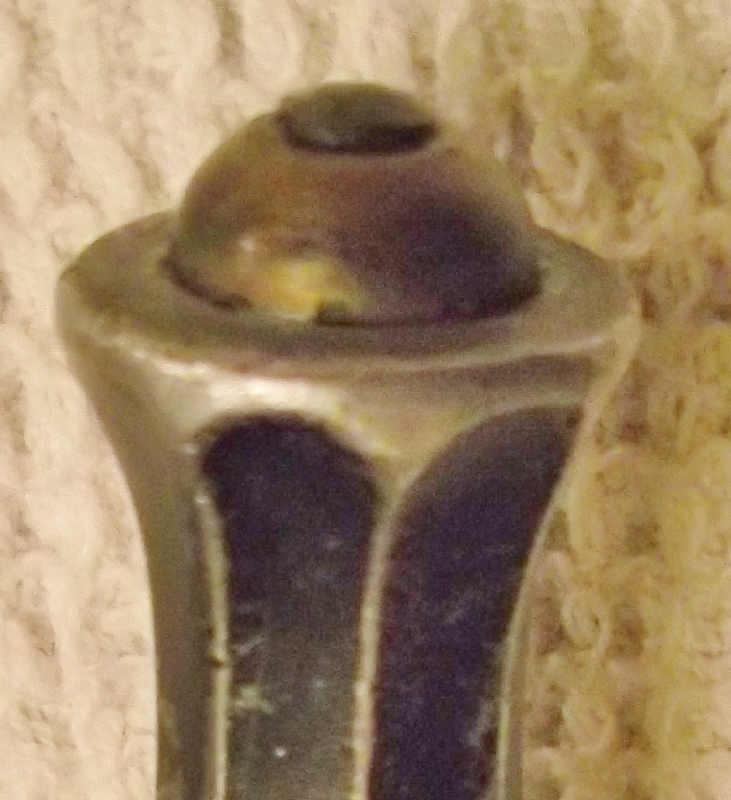 Above: Top nut on a Paisley X-Dagger with a hidden tang construction. 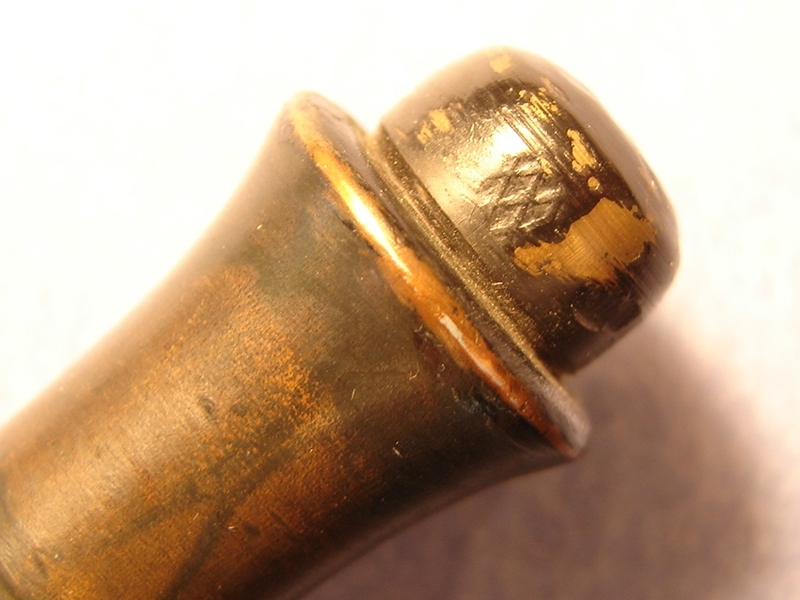 Top nut used on wood handled knives of the third pattern style. The tang is carefully peened over to secure the nut without cracking the wood. 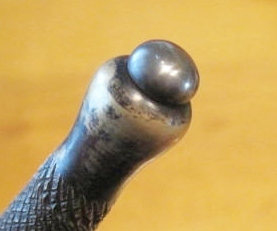 Below: Indian top nut with blind hole. Tang does not pass through. 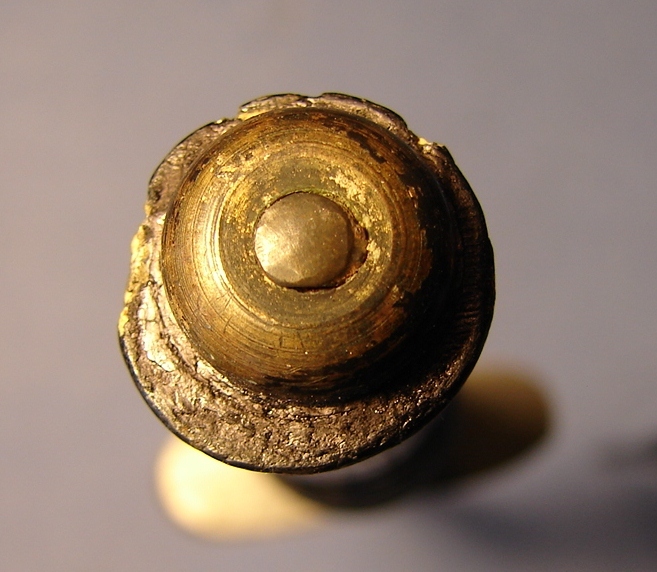 Below: Recessed nut on a P-3 knife whose handle was heavily shortened and with a guard stamped: "A. Coy." 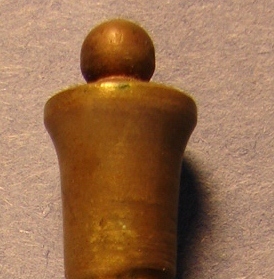 Below: Third pattern top nut with tall, squarish sides, with very little peening of the tang. It also has the imprint of vise jaws. 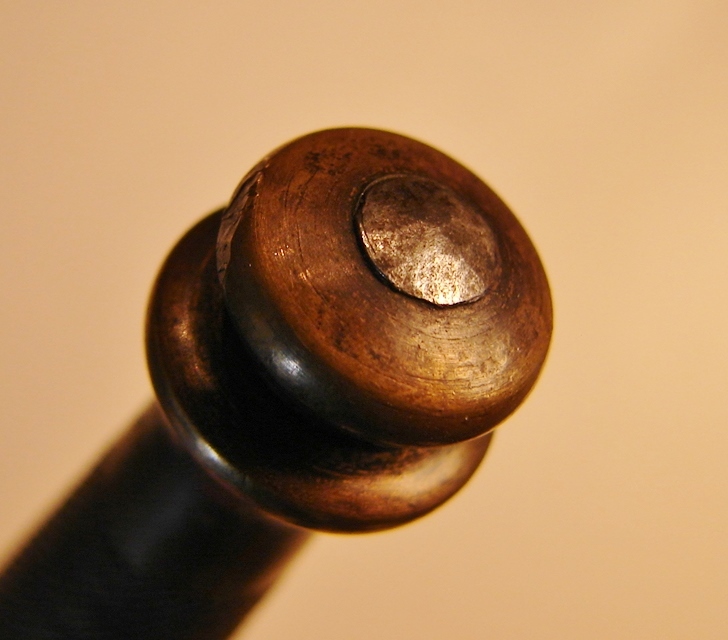 Below: Hex nut used on J. Nowill & Sons fighting knives. Below: Shown below are four third pattern handles exhibiting the mold numbers. The handles were cast in a gang mold and the numbers were for quality control puposes. Some numbers seem to be more common. In later production the mold numbers were polished off, especially with some of the nickle plated handles. From left to right are handles numbered 1 through 4. NEW NOTE: Now it is thought that the numbers represent four separate molds from four different manufacturers. 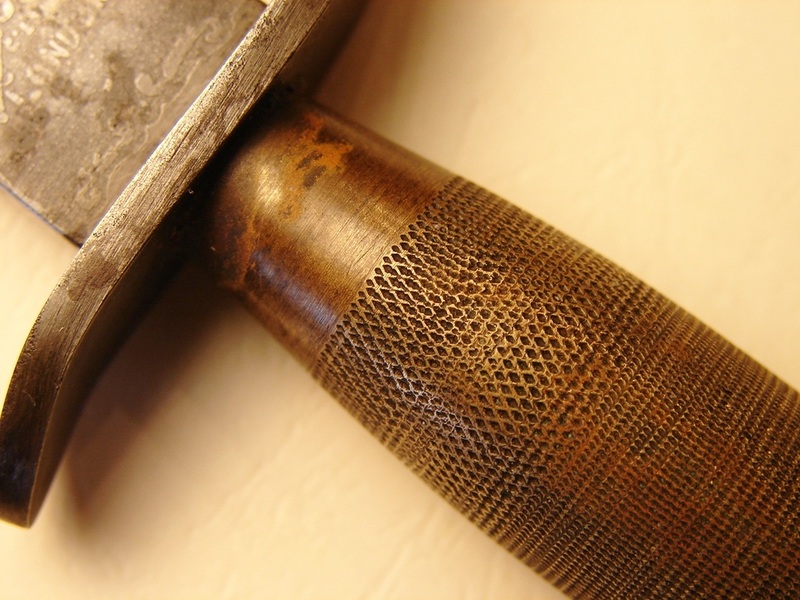 Below: Shown here is the top nut, unique pommel shape, and the knurling in the handle of the very rare First Pattern knife with skinny blade.